Brown Property Group and Henley have joined FightMND’s army to help fight Motor Neurone Disease (MND). 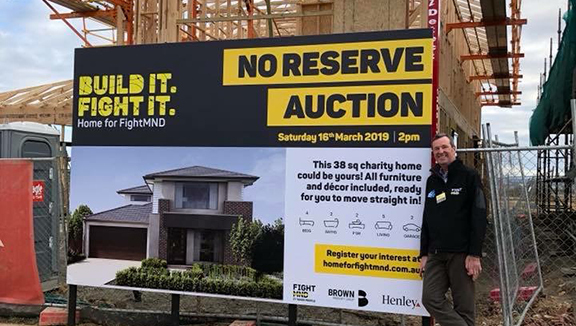 Brown Property Group and Henley, along with dozens of local trades and suppliers will build and donate a home to be auctioned for FighMND to help raise much needed funding for the FightMND movement. Brown Property Group are committed to supporting the community, with a strong focus on local Victorian charities, with past iniatives supporting the new St. John of God Hospital in Berwick, the Cranbourne Information and Support Service (CISS) as well the Aiding Casey Education (ACE) Foundation to name a few. Henley has a 27 year background of supporting philanthropic ventures and to date has donated 68 charity homes and over $26 million. Set on a beautifully located block in Brown Property Group’s Meridian Community in Clyde North, surrounded by a blend of stylish homes, tree-lined streets, parks and wetlands, all woven together with cycling and pedestrian paths and located only moments from an abundance of local amenity, minutes from the township of Berwick and easy access to Melbourne. The living, family, kitchen and alfresco zones integrate so seamlessly together that the alfresco becomes an extension of your living space. There’s also a leisure area upstairs. Click here to watch the launch of the FightMND Charity House at Meridian.